Good morning once again ladies and gentlemen. 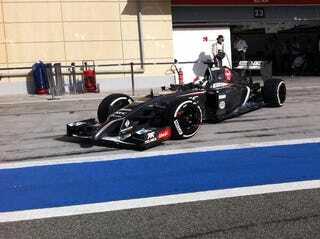 Today ends the first testing session in Bahrain. After this the teams have a quick couple day break to go over all the data and information they have collected thus far and try and apply that new knowledge to either fixing the car, per RedBull and all of the Renault's, or making the cars faster, such as McLaren, Mercedes, and Ferrari. So like always I will start my updates off with the time sheets so far today. Update 1: Perez's Force India is out with a gearbox failure that the team just can't fix by the end of the test so that ends Force India's first testing session early. Update 2: RedBull may be out for the rest of the day. They only managed so far today 15laps, and their might be something wrong with the car unrelated to the Renault engine, the car is back in the pits under many a curtain and wall. Update 3: Raikkonen is now too back in the garages with the entire track silent. Update 4: Just to give you all an idea of the pace the drivers are running. Last season, during qualifying at Bahrain, the fastest qualifying was Rosberg with a 1:32.3. The German is not that far off of that right now. All those concerned that this season won't be as fast, keep thinking. Update 5: Raikkonen is back out on the track alone. Update 6: I forgot to mention this earlier, for those that don't know, Williams just signed a new driver yesterday named Felipe Nasr. And currently he isn't doing to shabby for his first day on the job with being in 4th today. Update 7: Maldonado is back on the track after an earlier shunt, running with Raikkonen. Update 8: The newest driver on the grid, Nasr, just put in a 1:37.5 putting him awfully close to Raikkonen. These last few testing sessions seem to be showcasing the new talent coming into F1, I'm excited! Update 9: According to the Mercedes F1 Twitter page, Nico is having a spot of lunch and talking with his dad Keke. But they will soon be back out on the track. Update 11: According to veteran F1 reporter Dan Knuston of the BBC, he spoke with Ricciardo earlier today, this is what he had to say, "I'm sure the RB10 will be a quick car once the team gets it up and running properly". This doesn't sound too reassuring. Update 12: Caterham's Twitter page just announced that they hope to get their car back out before the day is over after some issues arose earlier today, "engine fired up, floor going back on" sounds like a bit more than simple issues. Update 13: Red Flag out on the course and the only man not back in the pits yet is Rosberg. Update 14: Rosberg is indeed the man that caused the Red Flag, he has stopped in turn three, which is interesting since turn three really isn't a turn as more of a gentle curve in the track. It looks to be a very fast turn, but still. Take a look. Update 15: Green flag drops and we are back under way with just about an hour left to go in today's testing. Update 16: Kobayashi and Maldonado are back on track with Kobayashi going with a 1:47 his first lap and then finding 3.6s for his second lap. Update 17: Vergne is back on track too with Torro Rosso posting this picture on their Twitter. Update 18:Marussia are still trying to get Bianchi back out on track by days end. Update 19: The Jalop poster boy, Raikkonen is heading back out too with Ferrari posting this pic with the BBC. Update 20: Maldonado sets fastest time in testing for a Renault powered car with a 1:38.7 which is still miles away from the leaders. It may as well be the moon at this point, especially in a sport that is usually measured in hundreth's of a second. Update 21: Through William's Twitter, they just announced that their newest driver has already done 80 laps today, this is massive since that the Renault powered cars are struggling to do that with the last few days of testing. Update 22: With little time left, everyone is speculating if the Infiniti team will make another debut? Autosport's Edd Straw is in the pitlane right now and all he can tell is that the garage doors are closed, Ricciardo is looking mighty unhappy, and there seems to be much commotion going on within the garage. Update 23: Mercedes is out for the rest of the day after the car stalled in turn three with Rosberg. Update 24: Nasr is back on the track after a quick pit stop. Update 25: Short stint for Nasr who brings the car back to the pits leaving only Kobayashi out on the track. Update 27: Finally back under green with Nasr, Raikkonen, Maldonado, Kobayashi, Vergne and Bianchi all heading out for the last 15minutes of this test. Update 28: And with all of them going out Raikkonen might have gone a bit fast spun the car and now has caused a Red Flag which is sure to last until the end of the test. What's with Raikkonen spinning Ferrari's lately. And that's it for today here as always are the final times for today. Not much to summarize today. All this week the team most have been watching, RedBull, has spent 98% of their time in the garage. The teams now have until next week to play with all their data and see if they can finally get the Renault powered cars to actually work. We are only 19 days till the first race in Australia, and that is not a lot of time to fix these cars. Stay tuned next week where I will once again be live updating throughout the mornings of the second session test.